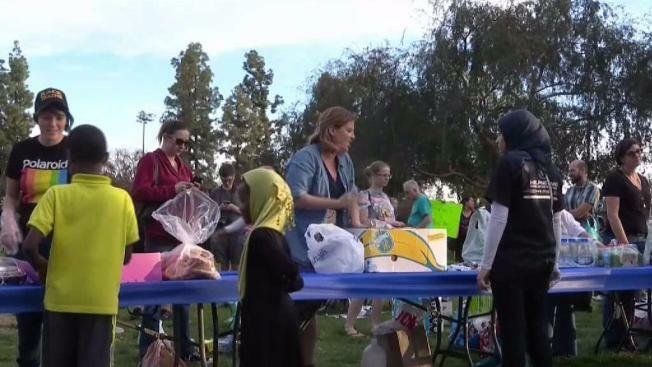 Twelve people are now facing misdemeanor charges in El Cajon, California, after handing out food to the homeless at a public park Sunday. Volunteers and groups showed up to Wells Park to hand out food, clothes, shoes and toiletries. As of Monday, the 12 people said they plan to take legal action against the city of El Cajon. “If I’m going to be arrested for something, let it be for feeding the homeless,” said Matthew Schneck, who was cited Sunday. “I’m not going to apologize for doing the right thing." El Cajon police wrote up citations to each person handing out food, including 14-year-old Ever Parmley. “I was passing out food and this guy was like can you step aside please," Parmley told NBC 7. They were each charged with a misdemeanor for violating El Cajon municipal code 1.28.010. The ordinance dates back to October 2017, during the height of the Hepatitis A outbreak. Charles Marks tells NBC 7, “I’ve been given a court date under the impression this represents being arrested on a misdemeanor, but it’s just a citation." The city said the ordinance was passed in an effort to stop the spread of the virus, and prohibits "food sharing" in public spaces, which includes city parks. In November, NBC 7 talked with councilmembers after signs were posted at Wells Park about the ordinance. Kalasho continued, “you can go out there, pick them up, take them back to your house and feed them and board them and room them and have them take a shower if you're really wanting to help." The City of El Cajon told NBC 7 the ordinance is meant to be temporary until the County lifts the emergency health declaration on Hepatitis A. In a statement, the city also said there are over a dozen locations in the area that serve free food to the homeless. An attorney representing the twelve people cited said he doesn’t believe the motive behind the ordinance is to stop the spread of Hepatitis A, but rather an attempt to get the homeless out of the city. Dreher plans to file motions to dismiss the misdemeanor charges and file an injunction against the city. The twelve people cited will have scheduled court dates and could face a $1,000 fine and jail time.